Luke 16:10(KJV); He that is faithful in that which is least is faithful also in much: and he that is unjust in the least is unjust also in much. God rewards faithfulness; not merely the office in which one is appointed. A high spiritual office does not mean that God will reward its holder more; for the office only represents greater responsibility on the part of its holder. Even if your part is to do the most menial task in the ministry, do so with the greatest joy because you know that you are serving in the house of God. As long as you are faithful in the little, God will reward you for it. Faithfulness has two elements to it: COMMITMENT and AVAILABILITY. Some people are committed but they are not available. Others are available but they are not committed. A committed Christian undertakes his duty with diligence and his heart is fully invested in what he does. An available Christian is ready to meet a need and stand in the gap as and when it arises. Purpose not only to commit your heart to the work of the gospel but to also be ever ready to serve whenever you are required to do so. 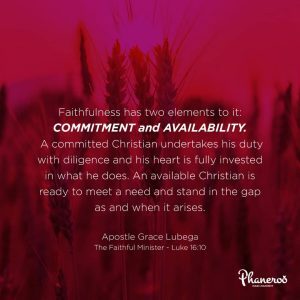 Faithfulness has two elements to it: COMMITMENT and AVAILABILITY. A committed Christian undertakes his duty with diligence and his heart is fully invested in what he does. An available Christian is ready to meet a need and stand in the gap as and when it arises. PRAYER: Heavenly Father, I thank you for today. I thank you for this Word that has instructed me in a great principle of ministry. I choose to serve with the knowledge that I am not serving men but the living God. I am available and committed to the work of the gospel. In Jesus’ name. Amen.